That got me looking back at the work I have done for Project KAT, which is now effectively version 1.0. 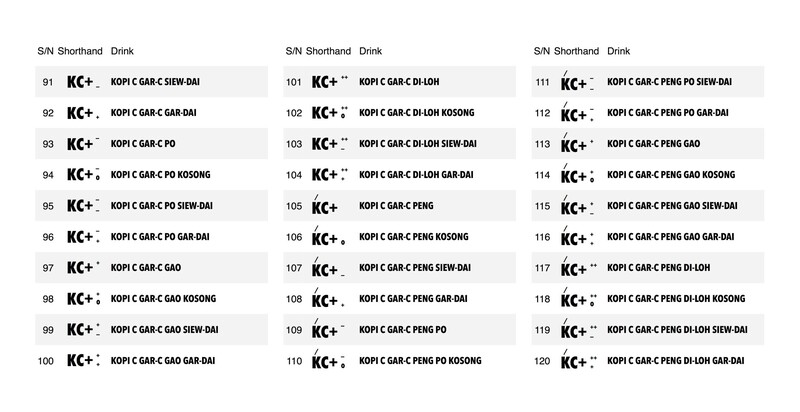 After going through my notes, I found designs that I could work on to build my own version of shorthand notations. Since the general feedback for 1.0 is that it is too overwhelming (binary anyone? ), I decide to use simplicity as the fundamental criterion for the design of these notations in 2.0. This is my template of the shorthand notation in English. The fields in grey are optional. When they are not present, the default options apply. 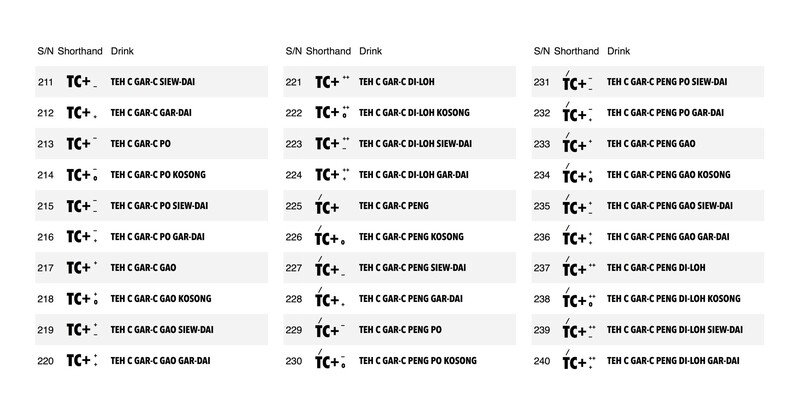 These defaults are represented by dots in the template for clarity only; there is no need to indicate these dots in the shorthand. This is the template in local context. The concept is simple to understand with these examples. 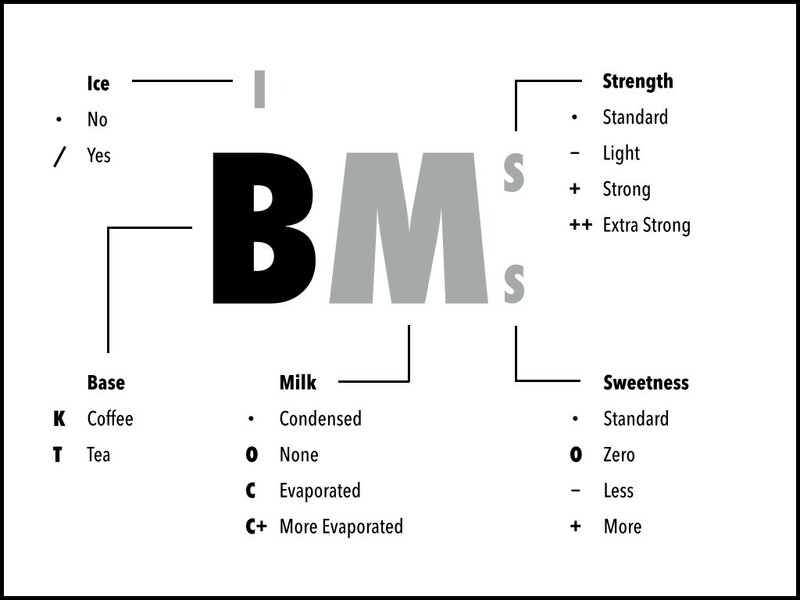 Built on concepts in 1.0 for consistency, you should find the 5 categories of Base, Milk, Ice, Strength and Sweetness (BMISS) familiar and that the notations are just a different representation of the same 240 drinks covered in 1.0. I use a forward slash / for cold drinks because it reminds me of the straw in 1.0 and it is very intuitive. I suppose nobody has time to draw ice cubes? 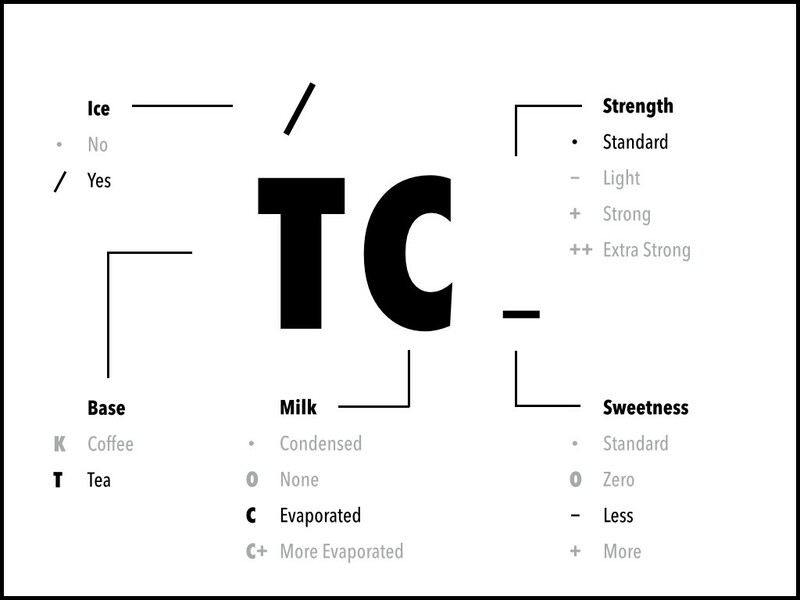 The sequence of categories in the local context is read in the order Base-Milk-Ice-Strength-Sweetness, although it is not evident from the template if you go with the typical left to right, top to bottom flow. 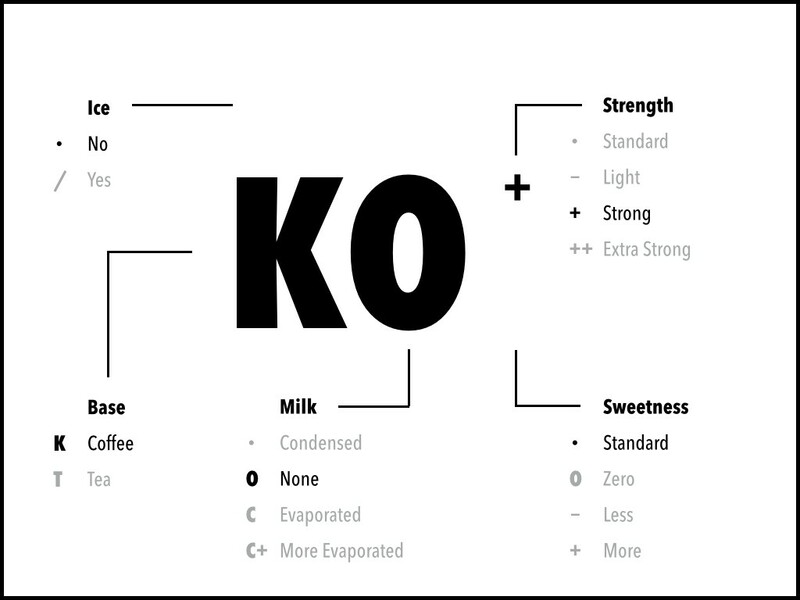 I sacrificed a bit of clarity for simplicity, which should not pose a problem for intermediate readers. 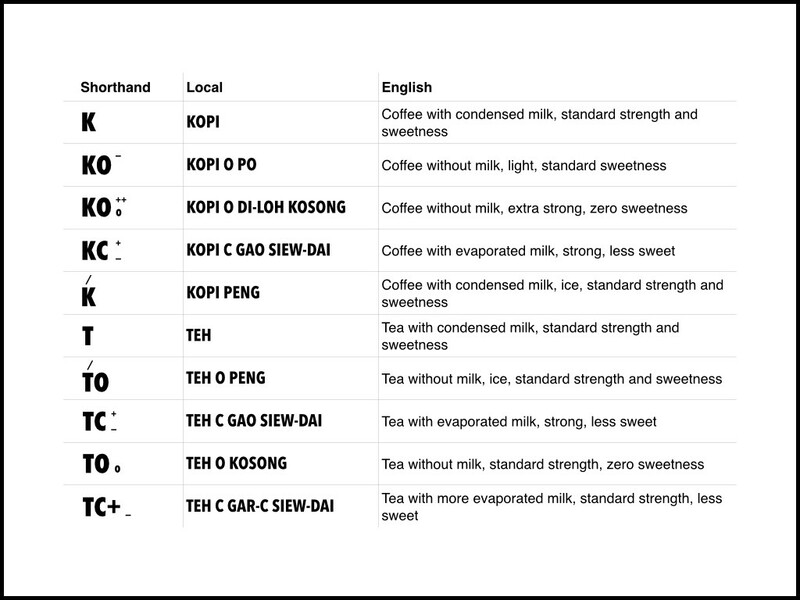 The sequence in English does not really matter (“Tea without milk, ice, strong, less sweet” or “Ice tea without milk, strong, less sweet” are both fine) but I tend to keep the same sequence for consistency. 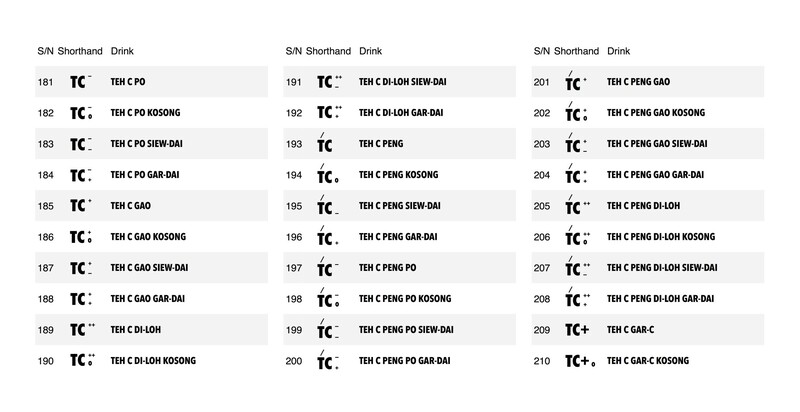 Here’s the shorthand of all the drinks covered in 1.0. 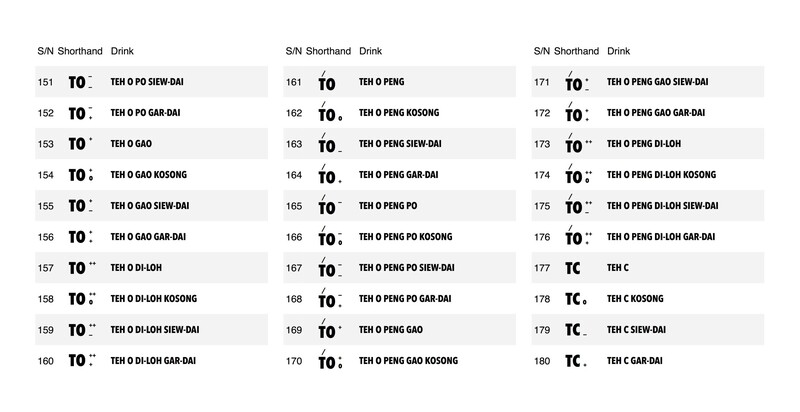 Why 240 drinks? There are 5 categories, each with 2, 4, 2, 4 and 4 options. That gives 256 (2 x 4 x 2 x 4 x 4) possibilities. 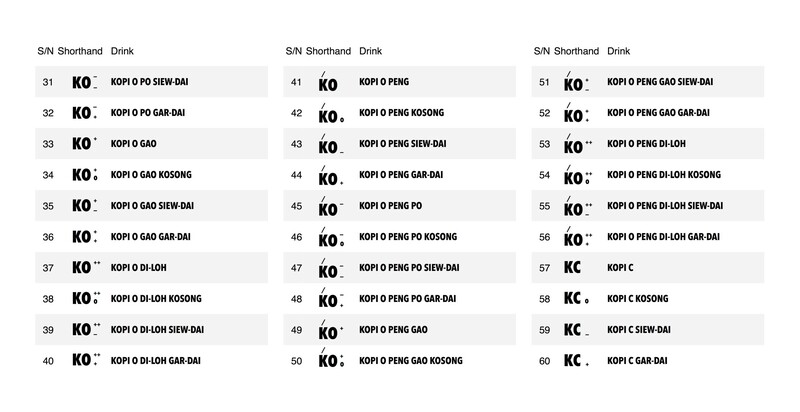 Since 8 combinations of KOPI KOSONG and 8 combinations of TEH KOSONG are invalid, that leaves us with a grand total of 240 (256–16) drinks. Again, in reality, some of these drinks are not so common. One final point. 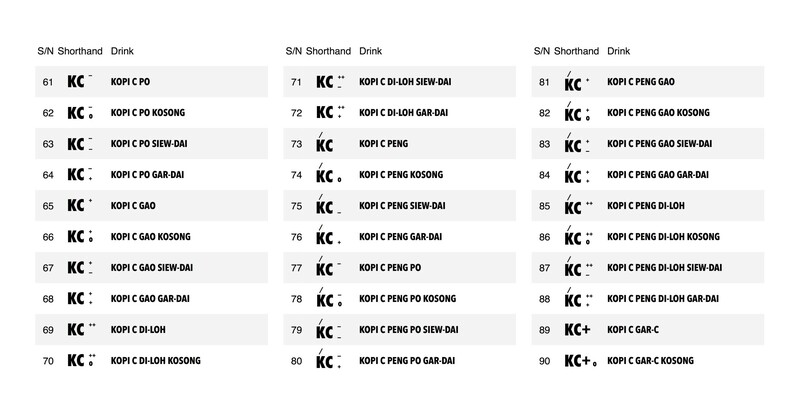 Unlike the decoding table in 1.0, this template can be intuitively extended to represent more drinks. 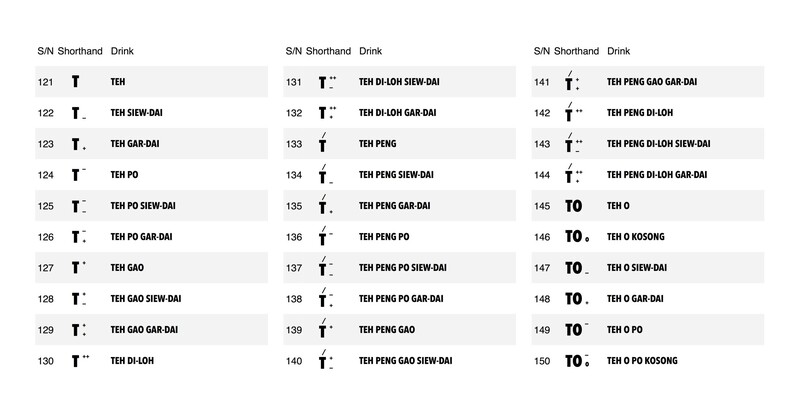 Without making explicit changes to the template, you should have no problem understanding these notations. 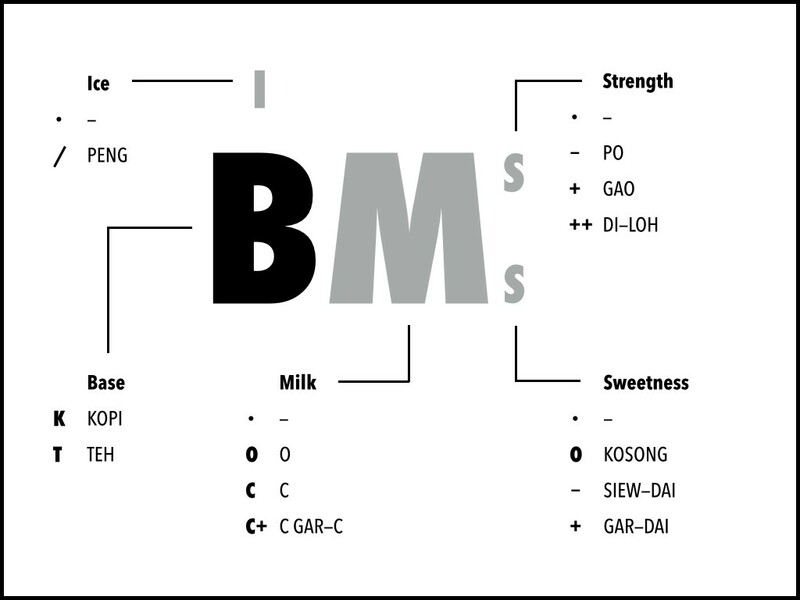 Essentially, this is my second attempt to systematically represent the local coffee and tea using the BMISS categories. 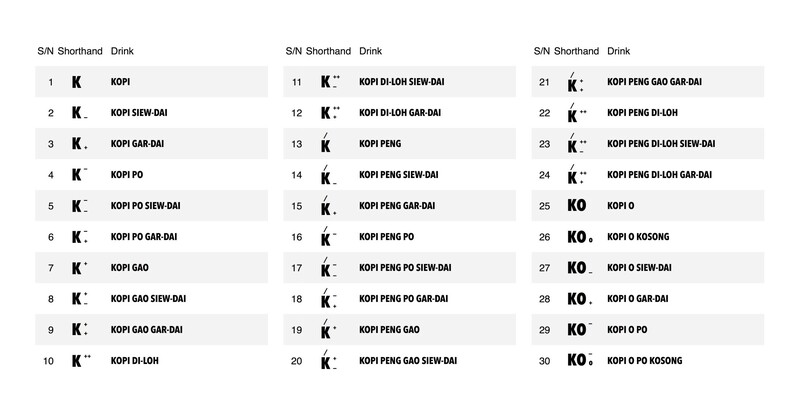 The shorthand notations derived here are comprehensive, intuitive and simple to understand. 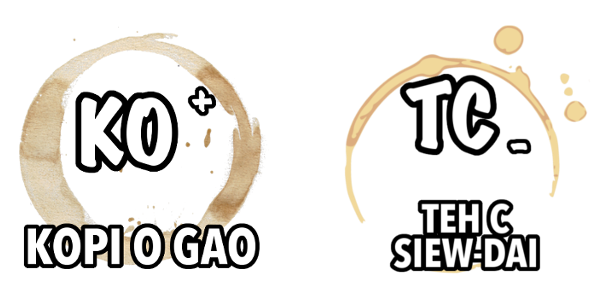 As with Project KAT, I hope you are intrigued by the awesome scene of local coffee and tea culture in Singapore. Try them if you drop by. I can’t say you will like them, but I can say it will be an authentic experience. March 2019 Update: I have created some WhatsApp stickers for Android.